Julie Lorch pedals along with notable members of Philly’s bicycle community on a route of their choice. They ride, they chat, she reports back. Yes, I’m listening, but I’m also plotting ways to get Stuart to break some traffic laws. (Members of the Bicycle Coalition are famous for following every rule). Maybe I can let her in on the pure joy of blowing through a red light? Or not coming to a complete stop at a four-way intersection? Or the prized wrong way down a one-way street? 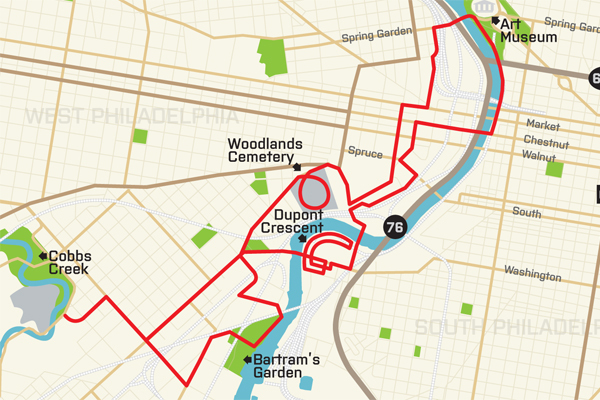 “[The study area] is part of finding the best route to get from Locust Street, which is the current trail terminus, to Bartram’s Garden,” she continues, “and then down to the Cobbs Creek Bikeway.” Stuart means business. I might just have to settle for riding side by side on a busy street. Last February, the City of Philadelphia secured $17.2 million in federal funding from the TIGER program (The U.S. Department of Transportation’s Transportation Investment Generating Economic Recovery Discretionary Grant Program). “It was truly amazing and fantastic,” enthuses Stuart. “There were over 1,400 applications.” The TIGER funding will build five segments below the Fairmount Dam, including a "Connector Bridge" over the CSX railroad tracks at Locust Street. The Connector Bridge is a special victory for Stuart, who began her bicycle/pedestrian advocacy work in 2004 with the Free the Schuylkill River Park campaign. The campaign successfully advocated for permanent street-level railroad crossings at Race and Locust, allowing unencumbered access to Schuylkill Banks. TIGER is also funding a boardwalk from Locust to South Street, streetscaping on the Walnut Street Bridge, a new trail through Bartram’s Garden and the “58th Street Connector” between Bartram’s and Cobbs Creek. We fold up the maps and head out on the Spring Garden bike lanes behind the Art Museum. Riding towards the West Bank Greenway, we meander through the pink blob, pausing in Woodlands Cemetery. Included on the National Register of Historic Places, the cemetery is so peaceful and well-landscaped that it immediately jumps to the top of my list of favorite places to explore on bicycle. Leaving the cemetery and heading towards Bartram’s, we approach a yellow light at the bottom of a hill. I really think she’s going to go for it. She has to go for it. I pull up to Stuart, joyously anticipating a run yellow. I can almost taste victory. When she hits the brakes on her Fuji commuter, I’m shocked—so shocked that I nick her saddlebag with my front wheel. We use the lesser known river entrance to Bartram’s Garden off 51st Street and Botanic Drive. The irony of this street name, which connects the oldest surviving botanical garden in North America to a PIDC-owned brownfield, cannot be overstated. Walking our bicycles up the freshly mowed pathway that will become Bartram’s Trail, Stuart and I find ourselves in a wild meadow, staring at the city skyline. It is an awe-inspiring moment. After leaving Bartram’s, we make a quick stop at Cobbs Creek—a bikeway that will soon be linked to the 58th Street Connector being developed by the Pennsylvania Environmental Council (PEC)—and then head back towards the city via Grays Ferry.